The Central Board of Secondary Education (CBSE) will announce the result of Class 10 and Class 12 board examinations. The CBSE result 2019 for Class 12 and Class 10 will be declared in the last week of May. The CBSE 2019 result will be declared on its official website cbseresults.nic.in. Students will access the results from the official website. Alternatively, they will also be able to check it from the search page on Google. CBSE will conduct the Class 10 board examinations from 21st February 2019 to 29th March, 2019 while the Class 12 board examinations will be held from 15th February, 2019 to 3rd April, 2019. Students appearing in the exam will be eagerly waiting to check their results once the exams get over. A direct link to the official website and Google will also be made available on this page for the students to check their result without any difficulty. You can additionally also subscribe to alerts on CBSE result 2019 by filling in the application form provided at the top of this page. The Central Board of Secondary Education (CBSE) has released the timetables of both class 10 and class 12 examinations. As far as the CBSE Result 2019 is concerned, the board is unlikely to offer much insight about the same. However, judging by the trends of the previous years, the students can expect the CBSE results for both Class 10 and Class 12 by the last week of May 2019. Last year, the CBSE result of the Class 10 examinations were declared on May 29, 2018 and Class 12 on May 26, 2018. For more such updates and news about CBSE Result 2019 declaration date, students should bookmark this page and visit it regularly. You can also register for our email update services under which we would be providing regular updates and news to concerned students about CBSE Result 2019. Students awaiting their Class 10 and Class 12 board exam results are likely under a lot of pressure due to the constantly increasing competition. Therefore, to help the students calm their nerves and gauge their competition and performance as well as to prepare them for the outcome of their hard work in the form of CBSE result 2019, we have provided a detailed analysis of the same below. The CBSE had conducted the Class 10 examinations from March 5 to April 4, 2018. The result of CBSE Class 10 exams was declared on 29th May. In 10th, the overall pass percentage was 86.70, said the board. Girls, with a pass percentage of 88.67, did better than the boys, who registered a pass percentage of 85.32. Prakhar Mittal from Gurugram, Rimzhim Agrawal from Bijnor, Nandni Garg from Shamli and Sreelakshmi G from Cochin, scored 499 marks out of 500 to jointly top the CBSE Class 10th Examinations. Last year, The CBSE had conducted the Class 12 examinations from March 5 to April 13. The CBSE Class 12 result was declared on 26th May. In the Class 12 results last year, the overall pass percentage was 83.01 per cent. Meghna Srivastava topped all India with 499 marks out of 500. Girls again outperformed boys with a pass percentage of 88.31 per cent against 78.99 per cent. Where to Check CBSE 10th & 12th Result 2019? The Central Board of Secondary Education (CBSE) will upload the CBSE result 2019 on its official website. The CBSE 2019 result for both Class 10 and 12 will be released in the form of scorecards. Students often come across many hassles while checking the CBSE examination result. To make the process of checking CBSE result 2019 easier for the students, the CBSE Board has made elaborate arrangements to publish them online on their official website i.e. cbse.nic.in and cbseresults.nic.in. A direct link to the official page will also be made available on this page in order to help students check their CBSE Class 10 Result 2019 and CBSE Class 12 Result 2019 easily without any shortcomings. The direct link to check the CBSE 10th Result 2019 and CBSE Class 12 Result 2019 will be made available on this page as soon as it is officially announced by the board. Students should bookmark this page for regular updates on CBSE result 2019. Once you click on the submit button, your CBSE Result 2019 for Class 10/12 will be displayed on the computer screen. Students here will the option either to either download a soft copy of the scorecard or get a hard copy of the mark sheet printed for future reference. The task of keeping updated with all the latest information and news regarding the CBSE result 2019 can be very tedious. Students will spend online searching and continuously inquire in their schools about the probable dates for the CBSE Result 2019 but the chances of getting any relevant and reliable information is very less. As a solution to this problem, JagranJosh.com will provide regular updates about CBSE 10th Class Result 2019 and CBSE 12th Class Result 2019 via email to the students who register for email alerts. 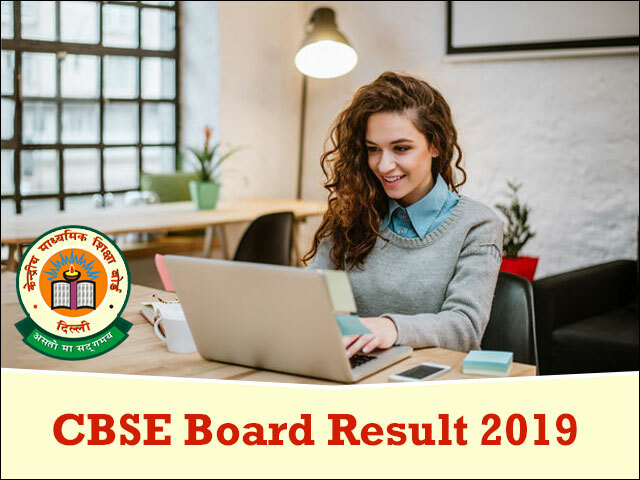 The expert team at JagranJosh will curate all the latest news and updates about CBSE Board Result 2019 and share it with the students on their email. Students can register their email IDs and mobile phone numbers on this page to start receiving these updates. What after Checking CBSE Result 2019? Once you have checked your CBSE 2019 result online, we recommend you to take the hard copy of the scorecard. You will be able to download a soft copy of the CBSE result 2019 in a PDF format. The scorecard made available in CBSE results for both Class 10 and Class 12 is the most important document for a student who appears for the examination. The students can use this printed or downloaded copy of the CBSE 10th/12th Board Result 2019 to plan their academic future ahead. Students must, however, keep in mind that a downloaded or printed copy of CBSE Result is only a provisional result and can't be used for any official purposes. The original marksheets will be issued by CBSE and sent to the schools. Therefore, the students must make sure that they collect the original mark sheet issued by the CBSE from their respective schools to authenticate their CBSE result 2019. The students who will feel that their efforts are not truly justified in the CBSE result 2019 and score less than expected marks can apply for rechecking/re-evaluation process. CBSE allows the students to register for rechecking and re-evaluation online. Students willing to apply for the same need to pay the required fee along with filling up the rechecking and/or re-evaluation form. Changes in result, if any, will be updated on the scorecards of the candidates and a fresh marksheet will be issued by the board. While the CBSE result 2019 may bring out colours of joy for many, some students may have to face disappointment. Despite efforts, certain students may fail to obtain the passing grades. Such students can choose to appear in the CBSE 2019 compartmental exam that is held a few months after the declaration of the results. Students willing to take up the CBSE compartmental exam are required to fill up the application form online and pay the requisite fees in the online mode only. The students will be issued separate admit cards and examination centres and their result of the CBSE compartmental exam will be updated accordingly. The Central Board of Secondary Education (CBSE) is the largest education board in India that looks after the development and propagation of secondary and higher secondary education in India. The board has been the part of the long history that has seen the development of school-level education in India. In the year 1952, the CBSE took the final shape that it operates today. Currently, the CBSE Board conducts annual examinations like CBSE 10th Board Exams and CBSE 12th Board Exams along with several other entrance tests. Central Board of Secondary Education has released the schedule for the post result declaration process to be followed. Candidates who have appeared for the class 10 and 12 results can check the detailed schedule here. Central Board of Secondary Education makes Art Education mandatory for classes 1 to 12. Minimum 2 periods to be devoted for the programmes says CBSE. The highest number of students was seen for the physical education examination. However, there were subjects where the turnout of students was less than 10 students across the country. Read details here.